Wahoo! 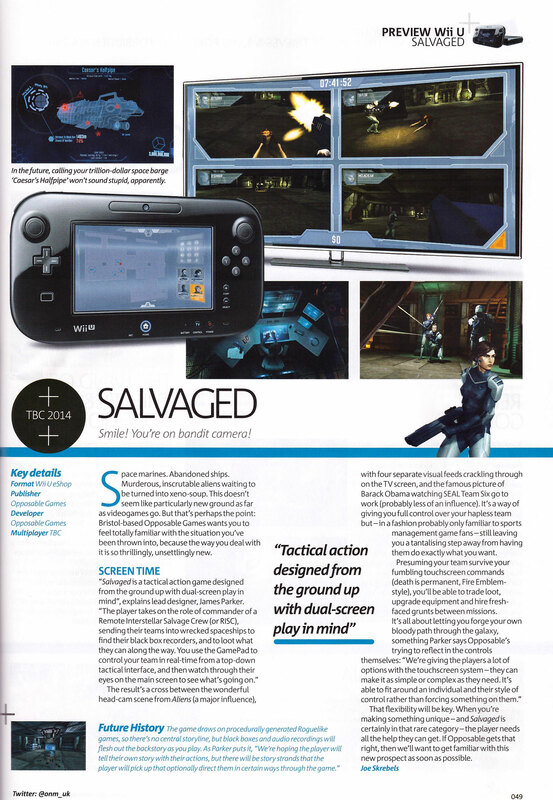 Joe Skrebels has previewed Salvaged in this month's Official Nintendo Magazine! While we all have a lot of love digital and mobile media at Opposable Games it's fantastic to be in print, especially in such a fine and established publication such as ONM. Check below for a scan and transcription. Thanks Joe! Space marines. Abandoned ships. Murderous, inscrutable aliens waiting to be turned into xeno-soup. This doesn’t seem like particularly new ground as far as videogames go. But that’s perhaps the point: Bristol-based Opposable Games wants you to feel totally familiar with the situation you’ve been thrown into, because the way you deal with it is so thrillingly, unsettlingly new. “Salvaged is a tactical action game designed from the ground up with dual-screen play in mind”, explains lead designer, James Parker. “The player takes on the role of commander of a Remote Interstellar Salvage Crew (or RISC), sending their teams into wrecked spaceships to find their black box recorders, and to loot what they can along the way. You use the GamePad to control your team in real-time from a top-down tactical interface, and then watch through their eyes on the main screen to see what’s going on”. The result’s a cross between the wonderful head-cam scene from Aliens (a major influence), with four separate visual feeds crackling through on the TV screen, and the famous picture of Barack Obama watching SEAL Team Six go to work (probably less of an influence). It’s a way of giving you full control over the your hapless team but - in a fashion probably only familiar to sports management game fans - still leaving you a tantalising step away from having them do exactly what you want. That flexibility will be key. When you’re making something unique - and Salvaged is certainly in that rare category - the player needs all the help they can get. If Opposable gets that right, then we’ll want to get familiar with this new prospect as soon as possible.